If you're trying to go to the Cherry Blossom Festival (in any city), go on a weekday, it will be WAY less crowded. Wear comfortable walking shoes, you will walk. A lot. Try to pre plan the sights you want to see as some things you need tickets for tours and such. Most all the actual sights are free though. The weather is unpredictable so bring sweaters for the evenings, a light rain coat and an umbrella. Cherry Blossom Season only lasts about a week or two and it can start at the end of March or sometime in April through the second week of May, depending on weather. Not all blossoms bloom at the same time so some trees may be bare while others are in full bloom. Bring snacks in your bag if you don't want to eat ice cream, hot dogs, pizza or any carnival type of food while around the Basin. Most of the vendors we saw didn't have any "real food" or anything of substance. Favorite Restaurants: Founding Farmers, Joe's Seafood, Acqua al 2, Bar Dupont. You see the tulips out, the city starts to beam with colors and you realize, a very special time of the year is approaching. You guessed it, Cherry Blossom Festival time! Those few very special weeks per year when the blossom trees puff up with pale pink buds and you witness dainty pastel color petals falling from the treetops. Now since getting on a flight to Osaka, Japan might not be in the cards for you, don't fret, Washington DC might be a better option! Officially, the Cherry Blossom Festival is usually from the end of March to the beginning of April, depending on the weather of course. There is a great site I have used in the past to track the blossoms day by day; the bloom tracker, Cherry Blossom Watch. So very cool that there is a website dedicated entirely to that! My best friend Britt and I decided that since were based in NYC and so close, we would rent a car from Hertz and take a drive out to DC for the festival. We considered a few options on modes of transportation, car rental or Amtrak. We immediately crossed out the bus option. Personal preference. A car rental for one and a half days was about $160USD (but split between us both but not including tolls), and one round trip Amtrak ticket was about $300USD per person, depending on requested time and dates. We decided that having the freedom of the car and being able to roam around was key for us, so we opted for the car option. Total drive time: about 4 hours and 15 min. But when road tripping with your best friend, you never really mind the time spent in the car gossiping, eating junk food and jamming out to old school hip hop music and boy band songs. We booked a room on Hotels.com at the Sofitel Washington DC, which is an elegant luxury hotel in an excellent location and best part, it was only about $200USD per night! Score! We were only two blocks from the White House and a beautiful 10 min walk to the Tidal Basin, where we intended to walk around the Cherry Blossom Festival and enjoy the trees and monuments. This would be our second trip to DC in three years, so we wanted to focus mostly on the Tidal Basin area and the blossoms. On the walk from the hotel to the main walkway of the Tidal Basin, you will come across an area right before the Washington Monument that has tons of blossoming Cherry Blossom trees with not as many people. Great place to take photos without having a ton of people in the background. Its completely magical! Lie down, look up and soak in the serenity of the plush white bloom falling gracefully around you. Through the first set of Cherry Blossom trees, you will walk up and see the world famous Washington Monument. Can you believe more than 600,000 people visit this place a year? The obelisk- shaped memorial consists of marble, granite and bluestone gneiss and is the world tallest stone made structure at 555 feet tall. It is located east of the Reflecting Pool in between the Lincoln Memorial and the U.S. Capitol and can be seen through the hundreds of cherry blossom trees at the Tidal Basin. We walked around here, took some funny photos and continued on towards the Tidal Basin. There is a huge lawn surrounding the Washington Monument and you can bring blankets and food and soak in the sun in this area. You can also take a tour and go inside the Monument, but you must have a ticket which can be reserved here. Once you get to the Tidal Basin area, you will immediately feel it as the crowd of people gets more and more intense. You will see plenty of families, kids, tons of strollers, people dressed in traditional Japanese Kimonos, and people dressed as anime characters that bring liveliness to the festival. Everywhere you look there are cherry blossom trees and you will notice, they are all a different species. And with a little breeze, there is a flurry of falling blooms making the most heavenly backdrop for your memories (and photos!). 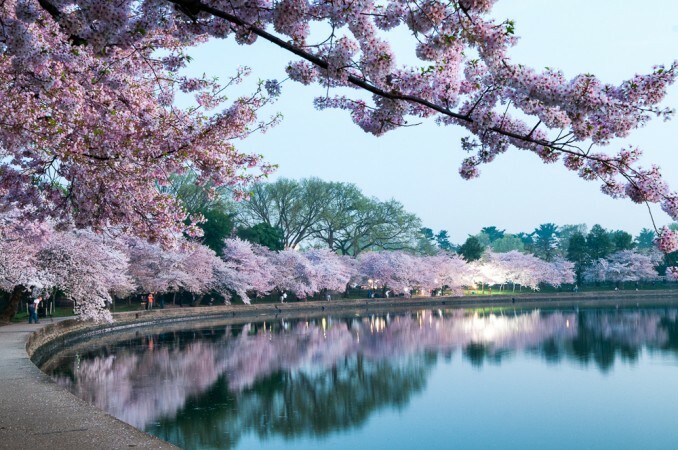 Interesting Facts: On March 27th, 1912, the first of the Cherry Blossom trees from Japan were planted at the North bank of the Tidal Basin. Today there are over 3,700 cherry blossom trees in total around the Tidal Basin which amass over 1.5 million visitors a year! Some of my favorite DC Blossom pictures are captured here. Check out their page as well to find out peak bloom forecasts. Its really helps if you are when planning a trip specifically see the trees! Being in DC and walking around, you can't help but to feel patriotic and reflect on the trials and tribulations that our country has endured, especially when you cross by the Lincoln Memorial Reflecting Pool at sunset. And if thats too much for you, just watching the glorious sunset with your best friend is just good enough. Feel free to share other places that you have spotted these gorgeous Cherry Blossoms! Newer PostWhich Cinque Terre Town are you?